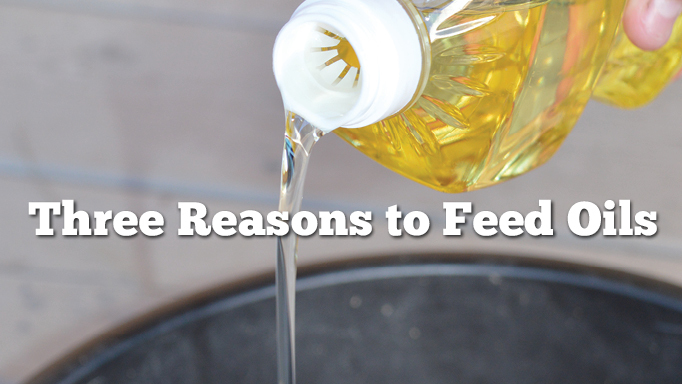 Why to feed oils, plus how, which type and how much. When we feed oils to horses, we are typically looking for three benefits. The first is energy, as when lipids (fats) are metabolized in the body they produce more adenosine triphosphate (ATP, the energy unit for cells) than, for example, carbohydrates. Specifically, fats provide almost 9 mcal/kg, while a low-fat commercial grain mix might provide 4 mcal/kg. 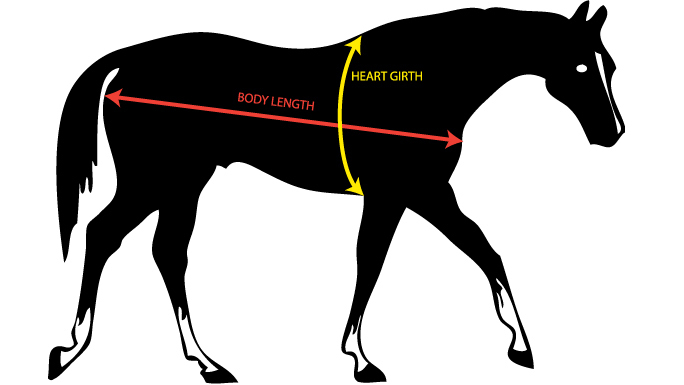 So, when we are looking to add calories to a horse’s diet, either because he is too lean or because he has higher calorie requirements than can be met with just forage and a safe amount of cereal grain concentrates (i.e. athletic horses), adding oil can be an effective and inexpensive way to add calories. One measuring cup of oil provides more than 2.2 mcal (an athletic 500kg horse might require between 25-32 mcal of energy per day), and horses can typically consume up to two cups per day. Another benefit to adding fat is based on the metabolism of fat within the body. Calories from oil are considered “cool calories” because they don’t tend to have any behavioural side effects like higher starch and sugar types of energy feeds, such as cereal grain-based concentrates, that can cause “sugar rushes,” causing horses to be sensitive and excitable. Oils are also “cool” because they are digested and metabolized very efficiently by the horse, and don’t produce much heat as a by-product of digestive/metabolism (called the “heat increment of feeding”) compared to feeds higher in fibre, protein or starch. This can be particularly beneficial to horses in hot climates. There are also added metabolic benefits to having a higher proportion of calories come from fat than from sugar. Athletic horses that are adapted to a higher fat diet may depend less on glycogen (the storage form of sugar inside the muscle) breakdown to fuel exercise, potentially decreasing lactic acid production, which benefits high-intensity short-term exercise, and spares glycogen for longer-term, endurance type of exercise. The third reason we would feed oils to horses is to take advantage of the potential health benefits associated with the omega-3 fatty acids found in many oils. Animals cannot synthesize omega-3 fatty acids, and, therefore, can only obtain them from the diet. Alpha-linolenic acid (ALA; 18:3, omega-3) is the common type of omega-3 found in plants that a horse would consume. Whole flaxseed (linseed) or the extracted oil products are good sources of ALA. The main function of ALA in the body is to convert it to eicosapentaenoic acid (EPA) and docosahexaenoic acid (DHA). DHA is found in the brain and skin, while EPA is important in mediating inflammatory processes. The potential health benefits of a diet rich in omega-3 fatty acids includes an improved hair coat and skin, and anti-inflammatory action for conditions such as joint pain/arthritis, allergies and gastric ulcers. 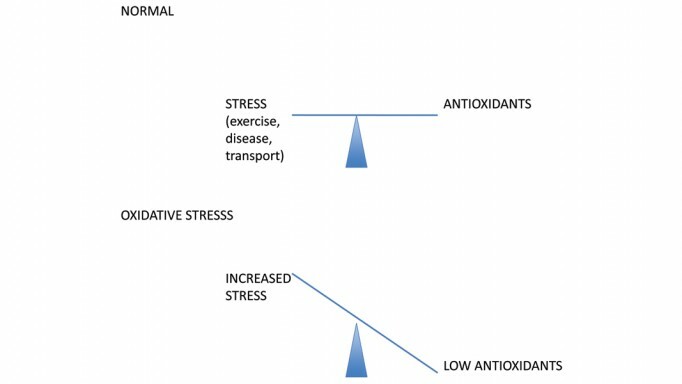 Work in humans has also suggested cardiovascular and cognitive benefits. It should be noted that horses (and humans) are not very good at converting ALA to EPA/DHA. Therefore, while vegetable oils can be good sources of ALA, the most effective way to get the potential health benefits of EPA and DHA is to give your horse fish oils, which are rich in these fats. Currently, there is no specific dietary requirement for the “essential” fatty acids (ALA and linoleic acid), though it is recommended that the ratio of omega-3 to omega-6 be between 2-5:1. So, when choosing to add oil to your horse’s diet, you need to consider why you are adding oil. If you are simply looking for additional calories, all oils (fish, corn, olive, etc.) have approximately 9 mcal/kg, and, therefore, you should simply select whichever is more economical. If adding calories to the diet, there are several commercial “high fat”/weight gain feeds, where fat might be upwards of 60% of the supplement. However, these are never going to have as much fat as actual fats and are always going to be more expensive than straight corn oil. Similarly, there doesn’t seem to be any metabolic advantage of one type of fat than another. If, however, you are looking for the benefits of the omega-3 fatty acids, you should be looking to straight fish oil. Many horses do not mind the taste/odour of fish oil, though some owners/managers do! I have personally seen the best hair coats in horses supplemented with fish oil that were part of a research study. If your horse does not appreciate the taste/smell, there are some commercial supplements that are relatively high in DHA and EPA. Ideally the supplement has more than 50% fat, and contains more than 2% EPA/DHA combined. High fat supplements should also contain vitamin E to help protect against rancidity and oxidation. When introducing oil, I always recommend starting with about ¼ cup of oil top dressed onto the horse’s normal grain mix, one time per day. Then increase to two times per day, and slowly increase the amount of oil added, to a maximum of two cups per day. 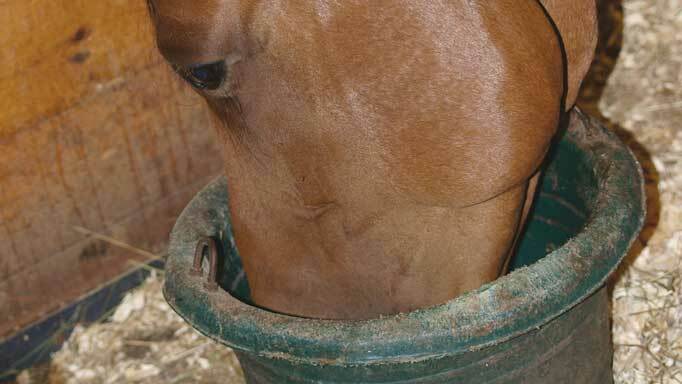 You might also find that your horse consumes less than two cups, and will not tolerate higher amounts, at which point you can back off and feed less until your horse is eating it well. Also, if you start to detect “shiny stools,” which is evidence of fat going through the digestive tract and straight into the poop, it means that your horse isn’t digesting it well, and you should decrease until the stool appears more normal. I also typically recommend feeding a mix of fish and vegetable oil if you are feeding oil for calories. That way you can save some money by feeding the cheaper vegetable oil, but also benefit from the direct sources of DHA and EPA. If your horse doesn’t need any extra calories, but might benefit from the omega-3s, a few ounces of fish oil per day should be sufficient. 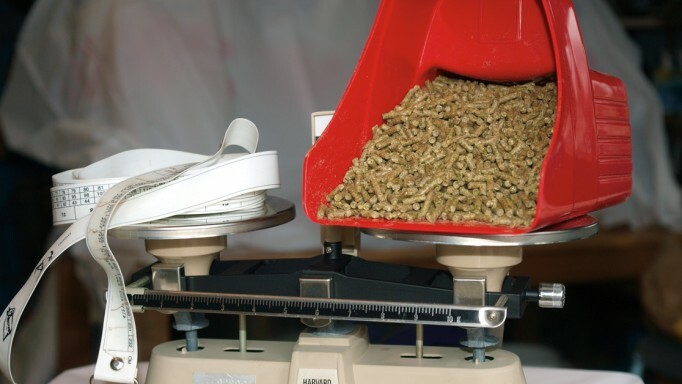 Feeding oil can be an inexpensive, safe and effective way to add calories to your horse’s diet that might also provide some metabolic, performance and health benefits to your horse. Oils are a type of lipid, or fat, that are liquid at room temperature. Fats are typically made up of three carbon chains (fatty acids) attached to a glycerol unit, forming a triglyceride. Fats differ based on the length of these carbon chains (short chain fatty acids vs. long chain fatty acids) as well as by the bonds between the carbon units. For example, unsaturated fatty acid chains have at least one carbon linked by double bonds, and are often “polyunsaturated,” meaning the chains have multiple double bonds, while saturated fatty acids have no double bonds between their chains. Saturated fats tend to be solid at room temperature, and, therefore, most oils we would feed horses are unsaturated. A further distinction can be made within unsaturated fats based on where the first double bond lies from the end of the chain; on the third carbon (omega-3; the double bond between the third and fourth carbon) or the sixth carbon (omega-6). The two most commonly found fats in an equine diet are linoleic acid (18:2, omega-6) and linolenic acid (18:3; omega-3). The first number represents the number of carbons: then the number of double bonds, followed by the placement of the first double bond.